Union County Freeholder Chair Bette Jane Kowalski, Vice Chairman Alexander Mirabella and Freeholder Christopher Hudak present a resolution to NJ Sharing Network Vice President and Chief Administrative Officer Elisse Glennon recognizing the month of April as National Donate Life Month in the County of Union. NJ Sharing Network, headquartered in New Providence, is the non-profit organization responsible for the recovery and placement of donated organs and tissue for those in need of a life-saving transplant. Realizing the urgent need for organ and tissue donors across the country, the National Donate Life Month observance promotes a greater understanding about the life-saving benefits of donation and transplantation. For more information about NJ Sharing Network, visit www.njsharingnetwork.org. 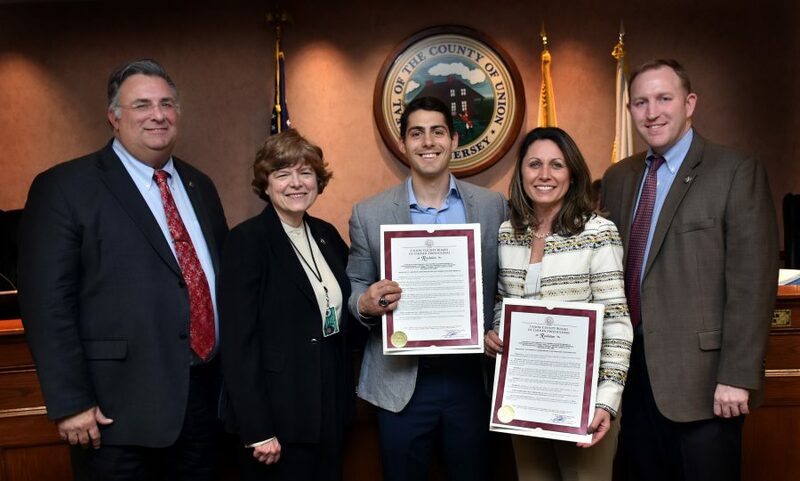 The Freeholders also presented a resolution to Cranford native Eric Walano commending him for selflessly donating a kidney to an individual in need. Mr. Walano attended a charity gala in 2017 to benefit Hearts for Emma. Hearts for Emma works closely in partnership with the New Jersey Sharing Network in order to raise awareness about organ donation. At this event, he was inspired to become an altruistic kidney donor.